Widawscy Studio Architektury have recently completed a new house in Sokolow Podlaski, Poland, and as part of the design, they created a master bedroom suite with patterns and textures. In the bedroom there’s a white brick wall that’s adjacent to a simple wood slat accent wall. The designers chose to use wood for the wall and the flooring in the sleeping area to add warmth to the bedroom. 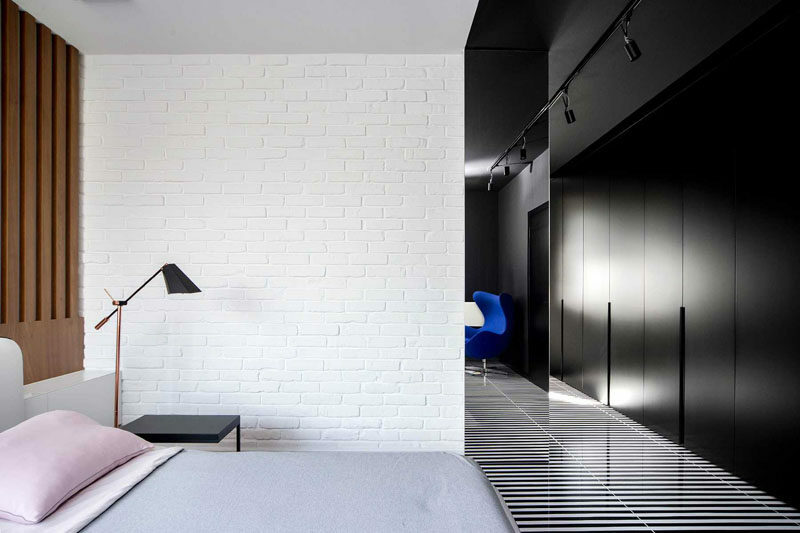 At the end of the bed, the flooring changes from wood into black and white striped tile. The striped flooring connects the bedroom to the closets and the bathroom. A wall of floor-to-ceiling matte black cabinetry lines the wall and provides plenty of closet space, while a mirror on the wall and a mirrored door on the bathroom reflects the design throughout the interior. Rick vibrant pops of blue have been added to the master suite in the form of the vanity in the bathroom and the chair in the bedroom.